Few migrant farmworkers have the time or money to seek out legal support. That’s where a mobile attorney like Melanie Gleason can help. In the summer of 2015, public interest attorney Melanie Gleason took her legal services business on the road. The 33-year-old-lawyer had just been sworn in to the Massachusetts bar and was ready to start practicing, but was concerned about the significant lack of legal resources for farmworkers and others in rural communities, and decided to go about filling the gap. For her new business, Attorney on the Move, she decided she would offer her services free of charge and she wouldn’t be tied to an office. Instead, she would be mobile in order to better help communities who rarely have access to legal services, much less the means to pay for them. Gleason crowdfunded her project, and by the end of July, she was heading out of Oakland in a Smartcar into the American West. 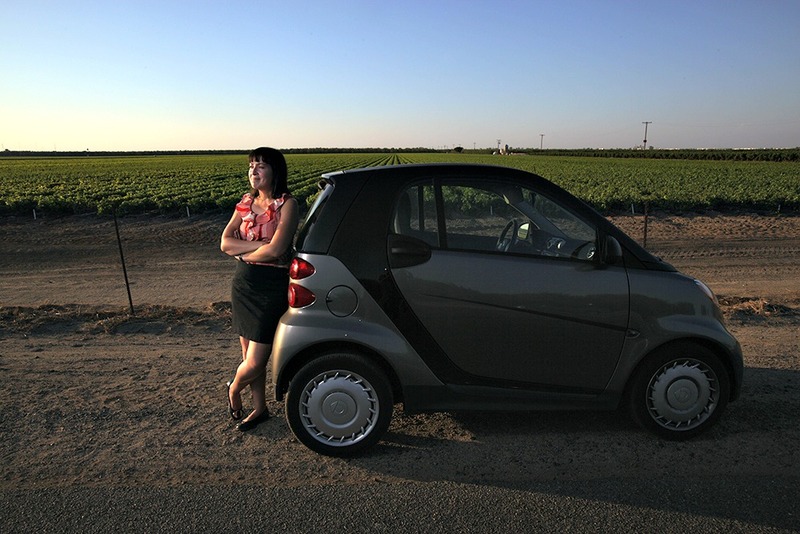 Her first stop: California’s San Joaquin Valley. Gleason spent about a month in Delano, outside of Bakersfield, where Cesar Chavez founded the United Farmworkers Union. She partnered with the California Rural Legal Assistance (CRLA), an organization founded to provide much-needed legal assistance to farmworkers dealing with issues like substandard, unsafe housing, wage theft, and industry-wide sexual harassment. Farmworkers are often vulnerable because laws designed to protect worker rights don’t apply to agricultural workers in many cases, says Lisa Cisneros, lesbian, gay, bisexual, transgender (LGBT) Program Director at CRLA. “Even when those laws do apply to the agriculture industry, often times they are under-enforced because there are few attorneys willing to represent farmworkers and government enforcement agencies lack adequate staff or language skills to outreach and communicate with these workers,” she says. Today it is estimated that there are 2.5 million farmworkers on farms and ranches, according to the U.S. Department of Labor’s National Agricultural Workers Survey, which does not account for crop workers. Nearly half of those 2.5 million workers lack work authorization (some sources say it’s closer to 70 percent), but even with the proper documents, farmworkers can face a variety of obstacles to the legal process, some of them at the most basic level. In one housing case, a Spanish-speaking farmworker client received all of his legal notices in English—which he couldn’t read. Another had to drive hours to get to the office to file a claim. “Picking in the fields is very physically taxing and many farmworkers end up working very long hours—often from sunrise until sundown,” says Gleason. So even if they might benefit from the help of a lawyer, it’s nearly impossible to make time to see one. The attorney also finds herself working with LGBT workers who feel their rights have been violated in the field. “LGBT workers frequently face harassment by coworkers and supervisors and, if they are living in isolated, hostile regions, they have few places to turn to for support and legal representation,” says Cisneros of the CRLA. It can mean a lot for marginalized groups to have someone like Gleason on their side to help them trust that their case will be handled with integrity. Gleason will continue to crowdfund efforts, and she also hopes work her way east, assessing legal needs and working with communities in New Mexico, Texas, and the Deep South. No matter who she is working with, Gleason ultimately wants more Americans to put themselves in the shoes of farmworkers, in the hopes that doing so can help improve their lives. Photo credits: Car photo (top) by Michael Fagans, field photo (middle) by Alex Horvath. 1 attorney per 6 people in San Francisco?